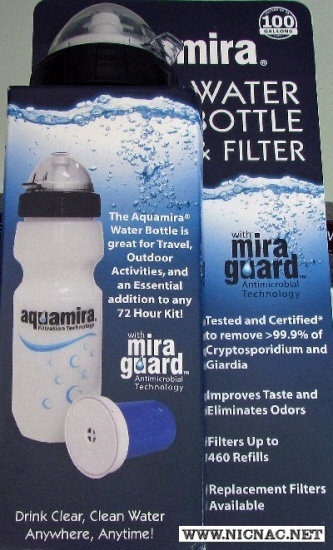 Aquamira Water Bottle and Filter. A safe and convenient way to drink clear clean tasting water ANYWHERE! Includes a high quality 22 oz Nalgene Sport Bottle with a sturdy push pull valve system and polycaronate flip cap to keep the drinking valve clean. A single filter treats up to 582 refills. This Aquamira Water Bottle fits most bicycle water bottle cages and back pack pockets. Lightweight and easy to use. Ideal for wilderness or adventure travel, daily use at home or work, camping, emergency kits and more!